Image by 4thglryofgod@flickr and made available under this licence. I’ve been married to Claire for seven years. If you asked me why I loved her I’d struggle to condense my answer into a brief sentence. I love her because she’s kind, because she’s thoughtful, because she’s smart, because she cares about me. My love for my wife isn’t just something that I accept, however; loving my wife is an action, an intention. Each day it is something that I work at, and which some days I am better at than others. In the gospels Jesus tells us that the most important commandment is to love the Lord our God. Some might question this rule and ask why we should love God. Why should we love a God who at times can feel so distant from us? Why should we love a God who we cannot see, who allows pain, suffering and injustice to exist in the world? The apostle John, writing in his first letter, provides us with an answer to these questions. 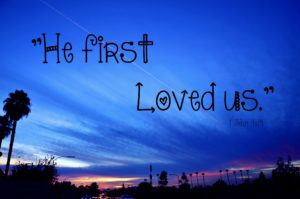 He says that the reason we love God is because he first loved us. If we adopt John’s thinking, it becomes much easier to love God. Sometimes we just need to stop and reflect about all that God has done for us. When we think of all the ways that God has demonstrated his love for us, loving God becomes much more straightforward, and something that we can work at doing every day. It might be that we think about the fundamentals – that God has created us, placed us into a world of stunning beauty, sent his son to die for us, and promised us an eternity with him in a new creation. It might be that we think about specific things he has done in our lives, perhaps giving us guidance, healing us, granting us children. All of these good things are examples of how God has lavished his love on us, and give us cause to love him back. However much you feel that you love God this morning, remember that loving God is something that we need to work at. Loving is an action as much as a frame of mind. Why not today try to think of all the ways that God has loved you, and try to love him back with all of your heart, your soul, your mind and your strength? This entry was posted in Bible Reflections, Daily Reflection, Thought of the Day and tagged 1 John. Bookmark the permalink.